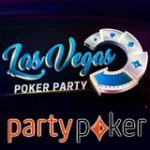 Kings of Vegas is a new promotion on Party Poker which offers players the chance to win one of twenty-five prize packages to the WPT500 Aria. Get your ticket to the Kings of Vegas final which takes place every Sunday from 26th April until 7th May. There are five WPT500 Aria prize packages to be won each week valued at $6,000 each for two persons. 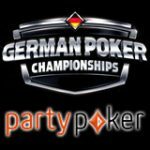 Players can qualify from as little as 1 poker point, new players can get a ticket to the final by making their first deposit. 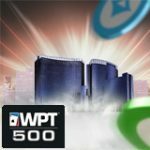 PartyPoker is making it easier for players to qualify for the WPT500 Aria event on the World Poker Tour. There are several ways to get your seat to the Kings of Vegas final tournament where there are five guaranteed prize package worth $6,000 to be won each week. 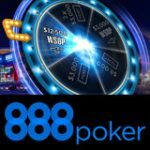 Win a ticket from Kings of Vegas Coinflip SNG. Make a deposit for a Kings of Vegas Final ticket. 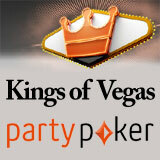 Purchase a Kings of Vegas Final ticket from the PartyPoker store. Sign-up as a new player and make a first deposit. New players can get their ticket to the weekly final by signing up and making a first deposit during the promotional dates. Depositing players will be issued a ticket to play any of the Kings of Vegas Final tournaments. Players signing up from the UK will also receive their ticket plus an extra £10 free. Complete the weekly challenge to get a ticket to the Coinflip SNG games where one lucky player will advance to the weekly final. Challenges include earning the required amount of points or playing specific poker games and completing the requirements each week. 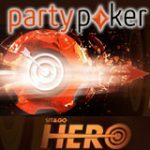 Make a deposit to receive tickets to the Coinflip SNG games or final tournament, players must use the PartyPoker deposit bonus code and deposit the required amount to get their entries. 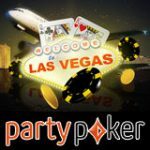 Use your PartyPoints to buy a tournament ticket to the Kings of Vegas Final tournament, tickets can be purchased from the PartyPoker store for only 150 points.